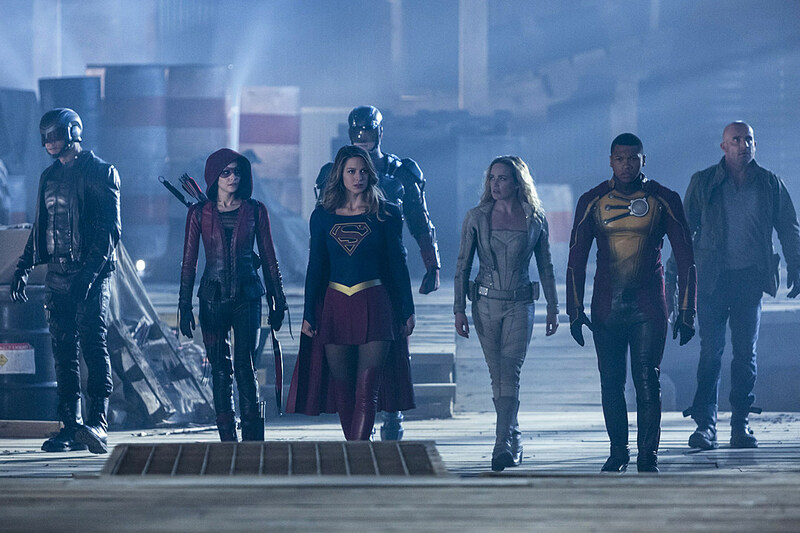 If the first Flash and Arrow crossover served largely to frame the division in tone between either series with two unrelated episodes, and the second functioned primarily to set up Legends of Tomorrow, it’s hard not to step back and view “Invasion!” as one giant monument to the growth of this CW universe. Arrow itself will be taking a more introspective look at that tomorrow night, but you could very easily spend another hour just rattling off the giddiest moments of seeing all these heroes interacting for the first time. As Joss Whedon would also attest, some of the most fun to be had with team-ups and crossovers comes from heroes themselves duking it out, and it’s especially cool that tonight’s big meta-brawl sees Barry and Oliver quite literally taking on the expanded universe they helped create. Pulling out all the stops for a giant 10-something brawl was a must, and the climax brought a really phenomenal mixture of Oliver against the more practically-depicted heroes on Arrow’s level of stuntwork, while Barry held off the more effects-heavy characters. Racing Supergirl (and just barely dodging heat vision blasts) was an especially nice cap as well, particularly the way in which Barry managed to use Kara’s invulnerability against her. 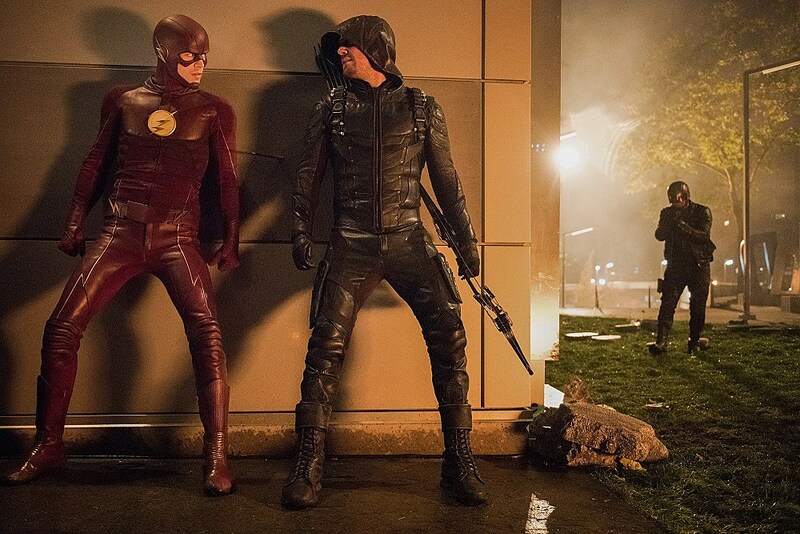 The elemental challenge of these crossovers is to make each hour work as an episode of that particular series as well, and apart from the (literal) running thread of Wally wanting to participate in the effort, it’s impressive that the first “Invasion!” leg managed to root all the internal and external strife around Barry’s mistakes changing the timeline. Flash fans have clamored forever for Barry to face the consequences of his weaker moments, and it’s good to see that “Killer Frost” wasn’t the end of it. Everyone from Diggle, to Sara and even Ray got their turn dressing down Barry for his selfish acts, and I get the sense we’ll discover even more consequence as Season 3 wears on. And again, grounding that conflict as a point of bonding with Oliver works particularly well, both inside and out* of the actual episode. No one beats themselves up better than Oliver Queen, and it takes that level of perspective to assure Barry that anyone would have taken the chance to see their family again, whatever lessons might come with it. Season 3’s definitely circling the idea of Barry atoning for all his meddling, and it’s hard to say what that might entail, given changes to the future newspaper, or Future Barry’s somewhat-confusing message, but a great showcase for Stephen Amell and Grant Gustin all the same. *Oliver’s outline of the many family horrors he’s personally witnessed worked well as a frame of reference for Barry, but also a handy reminder of everything Oliver himself will likely relive in the 100th episode on Wednesday. And don’t ask me how Flashpoint could change this without Oliver’s knowledge, but I’m still wondering if the specific description of Robert Queen’s death could have some bearing on Prometheus’ identity later on. The Dominators themselves understandably don’t get much definition in their brief scenes, as the hour has so much work and setup that we literally spend an entire scene of Kara attempting to remember everyone’s name. Functionally, there isn’t much room for Supergirl to carry her own universe’s dramatic weight into the crossover either (here’s to next year bringing over Martian Manhunter and Alex! ), but I do appreciate that “Invasion!” managed to find occasional spotlight for the smaller players like Caitlin and Dr. Stein, or Iris and Joe. Like I said, you could spend hours rattling off individual moments like Diggle’s reaction to the Legends, or Joe chiming in with is apparent knowledge of sci-fi, but this was an extremely promising (and surprisingly heavy!) start that managed not to lose focus on the Flash players. I realize that Flash wouldn’t have created the Kid Flash costume for use in only one episode, but hopefully Cisco comes up with an improved version. Ditto for the Atom suit upgrade! So, I guess they … disintegrated the President? For goodness sake, Barry, you had an extra nanosecond to look under Vigilante’s mask. Solid evil speedster burn, Oliver. And yes, that’s the famed Hall of Justice sitting abandoned on S.T.A.R. Labs property, but will it play any actual role in the future? Worth noting, Kara’s Earth-38 is presumably designated for the year Superman was first sold to Detective Comics. Understandably not everyone can participate, but would not Cisco’s Vibe powers prove useful against the Dominators? Kind of disappointed no one could make a dent against Supergirl, or that Oliver didn’t get a chance to outwit her somehow. Nice layering of setup, by the way, to refresh us on Snart and Rip’s supposed demises. Anyone else get Harry Potter battle flashbacks, with everyone firing at Oliver through dark S.T.A.R. Labs corridors? Kara’s now been inside of Barry. Just putting that out there, shippers. Flash will return Tuesday, December 6 with winter finale “The Present,” while the crossover continues with a 100th episode Arrow “Invasion!” tomorrow, airing at 8:00 P.M. on The CW.